How Did You Know That You Had Postpartum Depression? Author Vanessa RapisardaPosted on March 1, 2019 April 17, 2019 Categories 10 Questions About Postpartum DepressionTags how to know if you have postpartum depression, is it postpartum depression, is nausea a symptom of postpartum depression, postpartum anxiety, symptoms of postpartum depression, what are the symptoms of postpartum anxiety, whats the difference between postpartum depression and the baby bluesLeave a comment on How Did You Know That You Had Postpartum Depression? With more and more information about postpartum depression readily available to new moms, will they take the time to read it? When I was an expectant first time mom, I knew very little about postpartum depression. It was surprising because, as a researcher by nature, I wanted to know about every possible complication I could get. But I scoffed at the thought of getting postpartum depression. In my mind, mental illness was for the weak. And even if I did get it, I would never let it get the best of me – I was a strong, positive, confident person. I horrifically underestimated the power of postpartum depression. Ultimately, it did get the best of me and it’s a battle that I still fight to this very day. I sadly regret not taking the time to learn more about maternal mental health and postpartum depression 10 years ago when I had the chance. So now I urge all new mothers, expectant mothers, first, second, third time mothers, to read as much information about postpartum depression as they can find, even if you doubt that you’ll get it. Here are some specific things that I wish I had known. 1. You don’t need to have a history of mental illness in order to get it. One of the biggest misconceptions about postpartum depression is that it can only occur if you have a history of mental illness. But because there is no clear reason why women get postpartum depression, this is not a fact we can rely heavily on. This means that you could get postpartum depression even if you’ve never dealt with mental illness before and have no family history of it. Another thing to take into consideration is the silent struggle of mental illness. It’s likely you DO have a family history of mental illness but it was never, ever spoken of. If we think the stigma of mental illness is an epidemic now, imagine what it was like 40 years ago, or more. Ruling out postpartum depression based solely on the fact that you have no history of mental illness is not a guarantee that you will not get it. 2. You can get it even if you have zero risk factors. You could still get it! Again, no one knows exactly why women get postpartum depression. Some theories say it has to do with a shift in the hormones – which would mean the risk factors actually have nothing to do with it at all. 3. It is not always triggered by trauma. Trauma is a recurring theme on the list of risk factors because it plays a huge role in mental illness. In fact, our first response when faced with postpartum depression is to think back to what traumatic experience could have caused this. It’s important to know that trauma is not the only trigger of postpartum depression. Mental illness tends to prey on the weak, and we are often at our weakest shortly after experiencing a life changing event such as becoming a mother. Sleep deprivation, physical pain from labor, fears and anxiety and even the simple act of change can all trigger feelings of depression. Cognitive behavior therapy is a great method to help figure out what is triggering the postpartum depression so that you can learn how to manage it. 4. It doesn’t necessarily start right after birth. Making it through the first six weeks unscathed does not mean that you’re in the clear. Symptoms of postpartum depression can show up anytime within the first year after giving birth. Some women experience the highest of highs after giving birth and can ride it out for months. This can make the drastic fall into postpartum depression that much more difficult. Care for new mothers normally ends around six weeks postpartum. So it’s not uncommon for symptoms of postpartum depression to show up after this point, when all the help and attention suddenly comes to a grinding halt. 5. It’s likely you will experience some form of the baby blues. It’s reported that 80% of new mothers suffer from the baby blues. The fact that it IS so common can actually make postpartum depression harder to diagnose because many women and medical professionals have trouble telling the two apart. The rule of thumb is that if the symptoms don’t go away after a couple weeks, then it’s probably postpartum depression. This usually results in mothers being brushed off if they express any kind of concern about their mental health in the first few weeks postpartum. While there’s no need to worry excessively that the baby blues will turn into something more – there are a few differences that you should keep an eye out for. 6. The most common symptoms are not the only ones. Feeling nothing, empty, or numb, is one of the most significant symptoms of postpartum depression because it’s what drives all the other symptoms. Being numb makes us feel fatigued and unable to do the most basic of tasks. We don’t want to go out anywhere or do anything. We don’t feel the urge to eat or sleep or laugh. We may not feel happy, but neither do we feel sad. Postpartum depression can also cause a variety of different physical symptoms. Normally we don’t associate physical symptoms with mental illness and so we turn into hypochondriacs trying to find the cause of our physical pain. 7. It can show up as anxiety, or a combination of depression and anxiety. Now here’s the real tricky part that always seems to confuse new mothers. Anxiety. When looking at a list of postpartum depression symptoms, the symptoms of anxiety and those of depression tend to be lumped together, making it even harder to know what it is you’re dealing with. A new mother can experience anxiety in combination with postpartum depression, which means that all of that emptiness is replaced with a constant state of fear and worry. It’s the kind of worry that keeps you up at night. Things that never seemed to bother you much before now feel like the biggest threats. You imagine horrible scenarios in your head and do things to prevent them from happening, as far-fetched as they might seem. Some new mothers deal with anxiety without the depression, in which case, they are not numb to all the normal emotions of motherhood but worry just the same. Anxiety is a dangerous mental health disorder that can open the door to intrusive thoughts, rage and obsessive compulsive disorder. 8. Your spouse or partner may be the first to notice that something is wrong. The people who know you best will notice a change in you before you realize it yourself. They may not tell you that they notice it, depending on your relationship, but they’ll know. It’s kind of hard to live that closely with someone and not be able to spot that something just isn’t right. 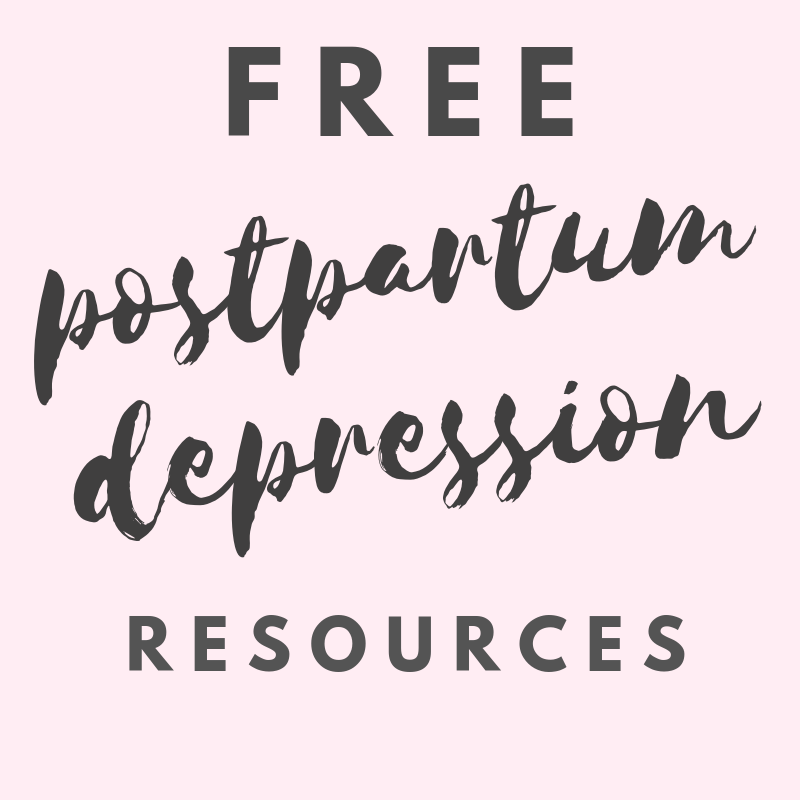 Part of the responsibility of your spouse, partner, baby’s father, etc., is to help you through this postpartum period and recognizing the signs of postpartum depression falls into that category. Even if they don’t know exactly what’s wrong, they should speak up if they think you’re acting differently. Try not to be offended or act defensively when someone you love says you might have postpartum depression. Approaching the subject of mental health is a hard task and the fact that they’ve said anything at all means they’re truly trying to help. 9. There is no shame in admitting that you have it. Mental illness is so stigmatized that women who are suffering from a valid, medical, postpartum complication are afraid to tell anyone. They believe that battling a mental illness makes them look weak, when in fact, the opposite is true. Warriors are working hard to end the stigma around maternal mental health, but until then, all we can do is educate others. The more people know about postpartum depression, the less shame there will be for those who carry the burden. 10. While there is no cure, it is treatable. Once it’s triggered, postpartum depression lingers around like the annoying friend who’s overstayed their welcome. With treatment, and a little extra work, it is entirely manageable. First off, mothers with postpartum depression need to proactively take care of themselves. They need to maintain their health and keep their stress level down. Mental illness thrives in a toxic environment, so it’s important to stay positive, eat right, sleep well and be mindful. Secondly, a form of professional treatment is a must. This could be anti-depressant medication, cognitive behavior therapy, acupuncture, massage therapy, or hypnosis, to name a few. There are treatment options that are all-natural and safe for breastfeeding, so that is not an excuse not to seek treatment. 11. The best place to get help is from someone who understands maternal mental health. When we hear of stories like Jessica Porten and Andrea Yates, the thought of talking to someone about postpartum depression is terrifying. These women are being treated like criminals by supposed professionals. And the public reaction to their “crimes” is even more disturbing. That’s why it’s important to seek help from someone that you trust, and someone who understands the reality of postpartum depression. A great place to start is Postpartum Support International. You can call a helpline to get all kinds of information and support. If you’re looking for more hands on help, talk to a postpartum doula who are trained specifically to help new mothers and recognize the symptoms of postpartum depression in it’s earliest stages. 12. If left untreated, you will likely struggle with symptoms for the rest of your life. Untreated depression is the number one cause of suicide in the world. Postpartum depression has claimed many lives and while it is a worst case scenario, it CAN happen to anyone. Even if the symptoms go away for a while, there is always the risk of a relapse. The only way to stay on top of the symptoms and win the battle against postpartum depression is by sticking to a treatment plan. 13. It’s entirely possible that you may not get it all, but it’s better to be prepared. I had three all-natural, drug free births, but that didn’t stop me from researching epidurals and c-sections. I was thankful that I didn’t have either of them but I wanted to be prepared in the event that I did. So why is postpartum depression any different? It’s the most common complication of childbirth and yet no one seems to know anything about it. There is no harm in researching postpartum depression prior to becoming a mother. My hope is that you don’t get it, because I wouldn’t wish it upon my worst enemy. But if you do, at least you’ll be prepared.